This extraordinary collection of photographs of the world's greatest drummers contains beautiful, incisive shots of hundreds of musicians, including Steve Gadd, Jeff Porcaro, Charlie Watts, Chad Smith, and many, many others. Photographer Jules Follett traveled to 53 cities in a two-year period to shoot the 486 artists captured here. These never-before-seen photos capture the player behind his kit doing what he/she does best. Additional bits of text talk about the musician and offer insights into what makes this particular instrumentalist so unique. Lissa Wales, one of the photographers involved in Sticks 'n' Skins , died in 2005, and this wonderful collection is in many ways a memorial to her special skills as a shooter. In the book's intro, Jules Follett memorializes her creative partner. "Your inspiration paved the way for the pages of this book. The following artists and photographs represent a mere glimpse into the vast catalog of your work. You were the trailblazer and would have been the first to be published in book from if you had been on earth longer. I am proud to be your messenger." 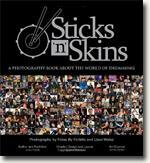 An exceptional book and a must-have for any drummer fans out there.